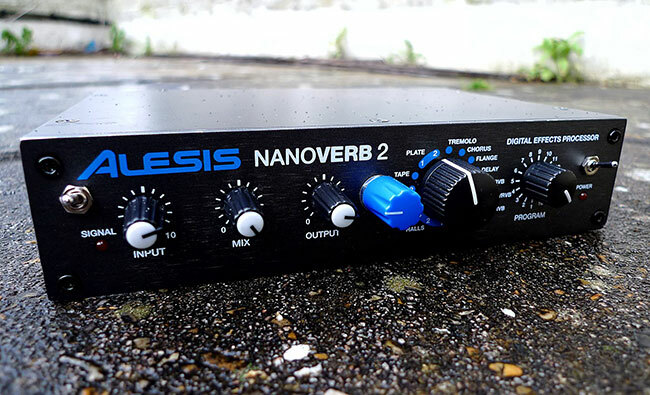 The original Alesis Nanoverb is one of those devices that Alesis used to have a talent for producing. 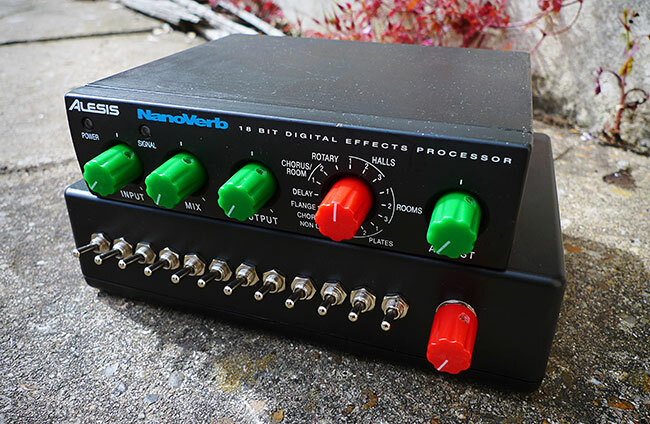 Like the 3630 compressor, the SR16 drum machine and the Quadraverb multi FX, the Nanoverb is one of those bits of kit that has been around unchanged for a couple of decades and everyone appears to have owned one at some point, but nobody can ever remember actually buying it! They're like Biros and lighters. You've got to assume that someone out there is buying them new, but you've never actually met anyone who would admit to it. They could be seen as general workhorse units. Never standing out enough to be noticed, but always there to fall back on. Nobody is ever going to profess an undying love for their Nanoverb, and yet it probably appears on more of their tracks than anything else they've ever owned. The original Nanoverb came out around 1996, and was probably one of the first of the 'basic FX with one editable parameter' boxes that became so popular around the late 90's and early 00's. You get some decent and very usable reverbs, along with a few other FX basics like flange. delay and chorus thrown in apparently as an afterthought. Obviously with only one knob to adjust one parameter you're pretty much stuck with what you're given for these other effects, but they' can certainly be pressed into service at a push. We've added a 12 way RAM decimation switch matrix in a bend bus arrangement, a LTC1799 based system reclocking knob and a reset button. The reset button isn't shown on the photos as we added it after the photos were taken, although having just recorded a demo we're not entirely sure why. It probably seemed necessary at the time. Its possible that the longer you use the switch matrix, the more crackle develops on the delay effects and this button resets the power to remove it. This thing isn't exactly stable, and as with many Alesis machines from the 90's the reclocking mod tends to crackle a little when you move it around past around 3 o clock or so on the knob, Its also very easy to let it get out of control and it can very quickly descend into wild distortion, but you can still get some useful effects, as shown by the demo below. The Nanoverb 2 was first produced in 2011 and is more or less a direct hardware update to the original version. It has a slightly wider range of effects with 16 presets for each effect type rather than a parameter adjustment knob. The effects are far cleaner and more precise than on the original unit, but whether that means they are better or not depends on your personal preference. It seems curiously difficult to find out the full details for this thing as Alesis seem extremely keen to mention its 52 bit DSP at every opportunity, but strangely reluctant to admit to the specs of its converters. The extremely careful way that Alesis have worded their promotional material makes you wonder whether the Nanoverb2 actually utilises full 52 bit processing, or it just happens to have a processor capable of 52 bit processing. 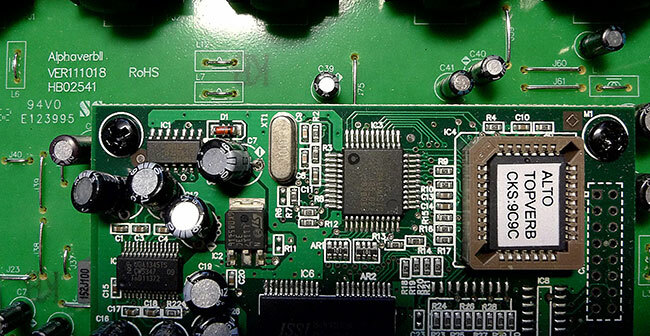 Strangely on the actual PCB it says 'AlphaverbII' and theres a microcontroller with an ALTO sticker. A quick search reveals another unit called the ALTO AlphaverbII, with an identical panel layout, but different colour scheme. We've only added three mods to this unit, but even with just the these mods its capable of creating sounds we've never heard from anything else! The mods consist of a power switch, a LTC1799 based reclocking knob that controls the speed of the whole system, and a switch that does something very weird, but we're not 100% sure what it is! Presumably due to the supposed 52 bit processing, the Nanoverb 2 is still fairly clean even when its clocked down to very low speeds. You don't tend to get quite the same aliasing noise and muffled sample rate reduction that you often hear on similar units when you slow down the processing rate, but you do get a certain amount of background hiss appearing. What the switch appears to do is to grab whatever audio data happens to be occupying the RAM at that moment and loop it round, but in the maddest way you can imagine. Its as if the Nanoverb 2 stores the sample data in a completely non linear way, and the switch makes it read the memory back from beginning to end so you get random chunks of sound vomiting forth in what sounds like bizarre tribal rhythms. Its especially effective in stereo where you get a wide stereo field surging back and forth. We've had a lot of interest in the mods for the Nanoverb 2, so we should probably point out that there are two versions of this unit. The first version is the one shown above with the rotary and tremolo effects onboard. The second version is the one shown below and on the Alesis site, although they haven't updated their description and still claim it has rotary and tremolo effects, when it doesn't! The downside of all this is that the Wavefront chip has on chip RAM, as opposed to the separate RAM chip that the first Nanoverb 2 uses. This means that any kind of glitching or RAM based effects are impossible to access and the weird looping switch cannot be installed. Possibly the reclocking knob might still work on these later models, but we've not tried it. This is the ALTO AlphaverbII, which appears to be identical to the first version of the Nanoverb 2 in every respect other than the colour scheme. We have installed exactly the same mods as on the Nanoverb 2 above. For some reason the AlphaverbII is described as a "40 bit digital effects module", which makes no sense given Alesis claims that the Nanoverb 2 is 52 bit and there are zero differences between the two units. Someone is being a little creative with their figures here!